Kitchen & Bathroom Storage Solutions. No matter what size your home, homeowners are always looking for practical and affordable home storage solutions. Hollywood Kitchens is an experienced and established company offering home renovations services. 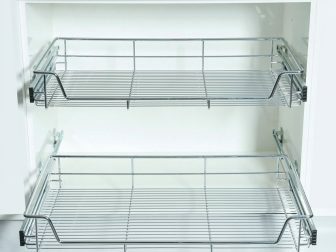 After talking with many of our clients, we realised there was a specific demand for additional storage space in your homes, particularly in your kitchens and bathrooms. We listened to you, and we now offer both affordable kitchen storage solutions as well as bathroom storage solutions. Just because you have limited space in these rooms, doesn’t mean you can’t put in additional storage. A little bit of creativity and innovation and you won’t believe the difference. We will help declutter these areas, providing space to store anything from dining utensils, spices, and pots and pans in the kitchen, to towels, toiletries and other necessities in the bathroom. Our storage solutions have helped Perth homeowners declutter their homes, hiding stuff out of sight while remaining easily accessible at the same time. At our showroom you will find the best storage accessories and appliances from trusted brands such as Häfele, and Wilson & Bradley, ensuring you receive great value and high-quality workmanship. 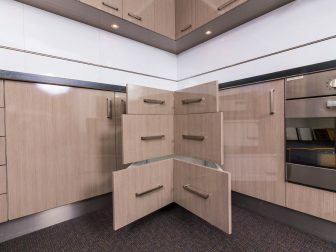 For modern, attractive and space-saving storage solutions for your kitchen or bathroom, contact us or call us on 08 9302 1156. 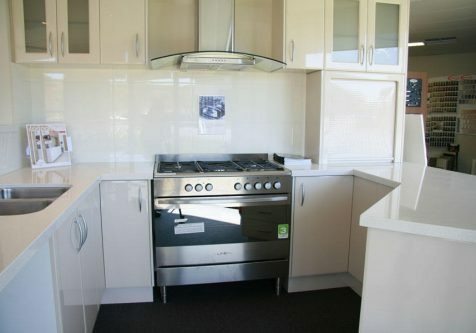 Alternatively, feel free to visit our showroom at Unit 1/8 Beneficial Way, Wangara, WA 6065. Magic Corner™ is an excellent product for maximising storage space in a cramped area. Produced by our partner Häfele, this corner cabinet can fit two separate cabinets thanks to its ingenious sliding technology. The result is a quiet and smooth cabinet that fits neatly in any corner, but is still bigger on the inside. 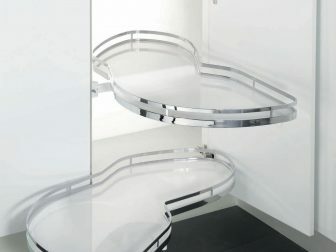 It will utilise an often unused area, providing storage without compromising on your available space. LeMans II is a corner unit solution by Häfele with two swinging trays. 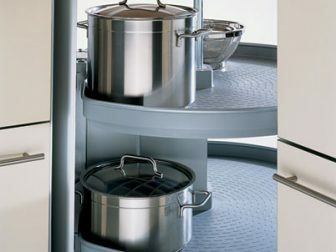 It allows you to store all your pots, pans and other appliances seamlessly, while still being easy to reach. Also by Häfele, the Mondo 2 is a great space-saving storage solution. This circular unit can fit neatly into any corner, complete with non-slip trays and two rotating shelves. 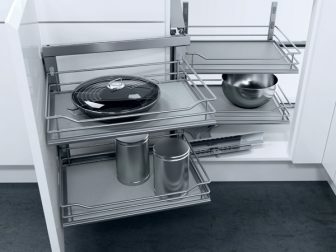 Modern sliding technology makes our line of wire pull-outs an effective drawer and cabinet organiser. Designed by our industry partner Wilson & Bradley, these pull out wire baskets can hold up to 45kg at once and come in a fine chrome finish. From the Wilson & Bradley line, these drawers are specially designed corner cupboard storage solutions. They pull out like normal drawers, using diagonal space and descending sizes to give you more room for everything a kitchen needs, from pots and pans to plates and utensils.